Where's the engine mounted on the Agora -thingies and have you managed to get a ride on Sydney's sole Scania N310 bendy yet? Swift wrote: Where's the engine mounted on the Agora -thingies and have you managed to get a ride on Sydney's sole Scania N310 bendy yet? No I haven't ridden the Scania low floor. It's hard enough finding it if you are in Sydney, impossible when you live out of Sydney! Winning lotto would be easier for me. Agora S/L - Vertically fitted in rear compartment. Agora Line - Horizontally fitted like conventional fully low floor bus (e.g. Citaro (Euro II-V), Lion's City etc). Same with the difference between Citelis and Citelis Line. All examples used with RATP in Paris. EDIT: the page has been updated recently. There are 18 Irisbuses in active service, but 19 in the fleet. Last edited by ZIB-585 on Sat Mar 26, 2016 8:43 pm, edited 1 time in total. Others like Iveco bypass the rear seat issue altogether! Both the above seem to get a better result on aisle width than the Mercedes. Trams have similar, though less extensive issues over bogies, but some tram models are completely stepless, like the CAF trams and the Variotrams before them in Sydney. 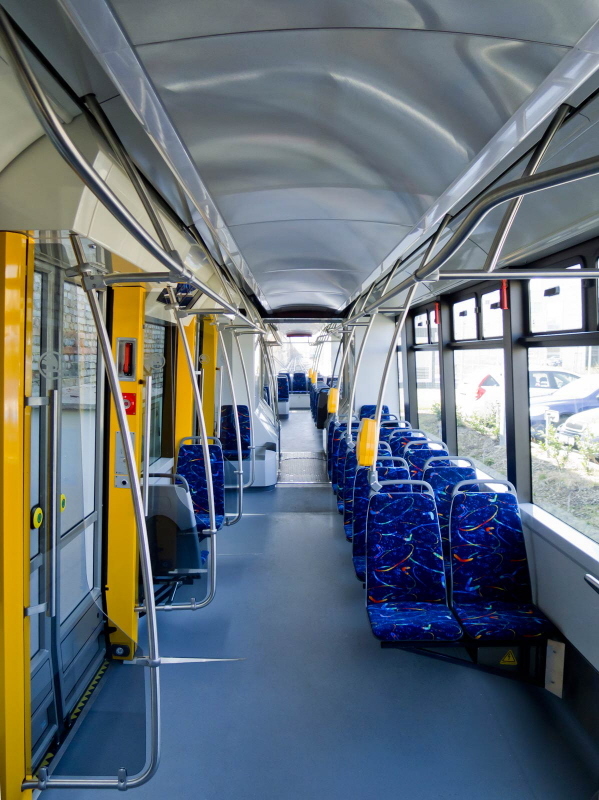 Like the bus industry, the tram industry also uses the term "100% low floor" but it's taken to mean that the whole of the aisle and doorways are low floor and as many seats as possible but, unlike trams, you're never going to get a "stepless" bus by the nature of its mechanics. What grates with me a bit is the b..s.. advertising of certain Australian bus manufacturers who claim that their buses are "ultra low floor". 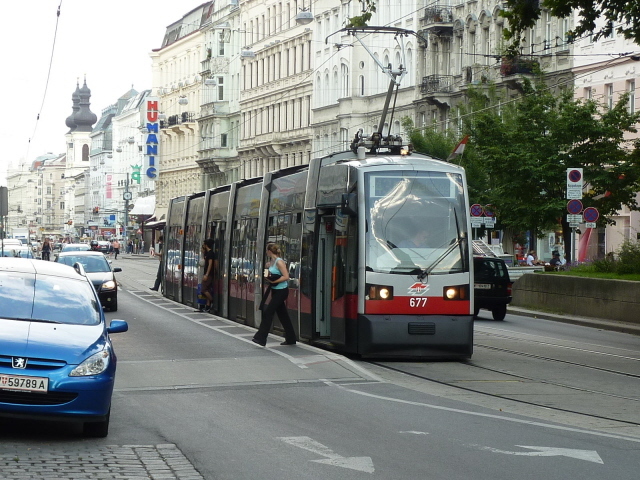 The only regular vehicle in the world meeting this standard is the stepless ULF tram in Vienna which has an access height at doors of 150 mm, compared to the more regular 300 mm. The Bustech VST/XDi for example barely even qualifies to be a low-entry vehicle as one of its doors has a step. A low entry vehicle is one that has a low floor and aisle around all the doors, but inside away from the doors (typically at the back) there are steps and sections of high floor. 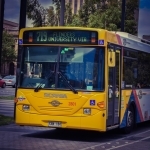 Most Australian urban buses are this format, as are many longer-distance suburban and interurban buses in Europe. Modern European citybuses, however, are now predominantly low floor (i.e. stepless aisle). This Citaro is one of those. European bus manufacturers have tried to get as close to this standard as possible. ABC (Austrilasian bus and coach) TV did a review of the Citaro, linky here. There is a review of the Brisbane Citaro in "Australian Bus" magazine, Sept/Oct 2016 now out. The reviewer concludes that it's the best citybus he's seen in Australia, superior to anything from the local builders. This is perfectly understandable but I still think MB (nor the Germans generally, including MAN) don't do the best job on seating or the gangway compared to their European rivals such as Iveco, Solaris and SOR. 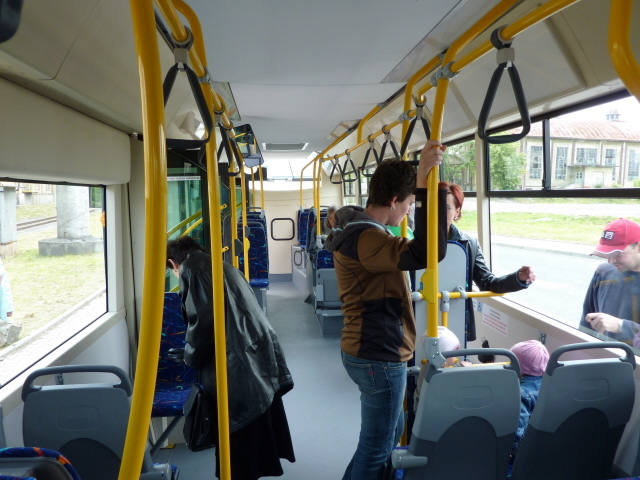 The gangway in the back half of the Citaro is a narrow trench compared to the more tram-like broad floor of its European rivals. In view of these issues I don't understand why the MB is so popular on the market. But in terms of Australia, it's a blessing to see at least one of these types of citybuses on display here. The breakthrough that still has to come in terms of functionality is provision for a third door behind the rear axle. tonyp wrote: There is a review of the Brisbane Citaro in "Australian Bus" magazine, Sept/Oct 2016 now out. The reviewer concludes that it's the best citybus he's seen in Australia, superior to anything from the local builders. Secondly, can someone please explain why, as quoted in the Australian Bus Review, you need a 'Special License', like you do to drive an Articulated or Double Deck Bus, to drive a bus that is only 50mm (5cm) wider than the ABS(?) maximum width limit and a "Locally Built" Bus' width of 2.5m. Why is this such a big deal? In my opinion, the ABS(?) making a big deal over the fact that the Citaro is "5cm too wide" is absolute BS. Seriously, the fact they're skeptical of the Citaro because it's 5cm too wide is BS when the Citaro's Positives and Safety Features outweigh the Negatives, e.g, my favourite was the bullbar underneath the futuristic front of the Citaro that has been PROVEN to greatly reduce Driver & Passenger injury in the event of a collision, though mainly Driver Injury because the bullbar deflects the energy and the impact underneath the front of the bus towards the front axle, basically something like that. To list another, there are cornering lights which are activated when using the indicators at night and they have proven very effective. Lastly, without trying to sound like Einstein, , technically, there isn't any true low floor Bus (Or Tram sort of because I'm referring more towards Buses here) because technically you still have to step onto the bus from the footpath and vice versa to get off unless the Driver activates the wheelchair ramp manually or automatically via a button or switch in the Driver's area. Don't take offence to anything I've said as I've not meant to offend anyone. The drivers that have driven this bus don't like it and it fills up way to quick, it spends most of its time in the depot these days. So the Citaro is not popular in Brisbane - a one off in a large fleet of Volgren bodied MAN's Scanias and others - how surprising. Perhaps some local parochialism has slipped in here!! The Citaro has a great reputation for in service efficiency and reliability - some 40,000 or more have been produced and sold to date. There are over 1,000 in service in Singapore alone, now spread over the 4 operators and they love them. Whilst I appreciate that we need to support our local products, we should acknowledge the competency of products produced overseas, when they deserve it! Interesting that BT drivers get to chose what buses to drive. I would have thought each shift would be allocated a particular fleet number. Must be a logistical nightmare keeping track of a large bus fleet- kilometres travelled, when servicing is due and cleaning and fuelling requirements. Allocating a bus to a known route would simplify this. Also BT arrange their depots with long ranks of buses, what happens if a driver fancies one at the back or a bus hemmed in by others? racingnathan wrote: The drivers that have driven this bus don't like it and it fills up way to quick, it spends most of its time in the depot these days. I can imagine a nickname for this bus by now, and it involves the first syllable rhyming with a swear word for excrement. 1of55 wrote: Interesting that BT drivers get to chose what buses to drive. I would have thought each shift would be allocated a particular fleet number. Must be a logistical nightmare keeping track of a large bus fleet- kilometres travelled, when servicing is due and cleaning and fuelling requirements. Allocating a bus to a known route would simplify this. Also BT arrange their depots with long ranks of buses, what happens if a driver fancies one at the back or a bus hemmed in by others? It may be something similar to what happens at Aldgate depot in Adelaide - drivers are assigned buses but can swap if it's not too hard. Sometimes weekends are allocated on Friday nights (happens at Aldgate as well), drivers of longer shifts can request a certain bus as well - whether it is accepted or not is another thing. Drivers don't get to choose what bus to drive, the Citaro is only approved to go on 14.5 tag axle routes and as it's an extra bus and there is 14.5's available drivers can refuse to take it. So now that we know that any regular length bus put on a 14.5m route is likely to fill up too quickly, is there any other reason on offer why drivers would hate it? Sounds like someone is trying to discredit the bus for being fully shipped here and not produced by a beloved local body builder. That's too funny, even though I reckon it's an excellent Bus for Australia, I just can't not laugh at that! P.S: Apologies if I offended anyone. I'm not a fan of completely low-floor buses, if I had to be honest. Similar to what Adelaide has (and I presume other cities) where the floor starts to rise after the centre door, is what I like. After looking at some of these shots of the 's**taro' ( ), it looks like an alright bus. But like I said, don't like the completely low-floor buses. And, the rear seat layout is poorly designed IMO..
Bring on full low floor buses I say. Interestingly, Adelaide actually has one, but it was bodied with a high floor/low entry body. The bus in question is 1801. From what I understand some drivers are refusing to drive it based on stress related factors if they bend/scrape/crash it. Having asked one the other day on a 111 I/B he stated it was easy enough to drive, had good power, but the mirrors he was terrified of clipping or damaging as they are fixed powered units with a higher repair cost. The Brisbane Transport trial Mercedes-benz Citaro is being withdrawn this week and a charter trip around Brisbane on Saturday, was a great opportunity to experience a ride in this 2.55 metre wide bus. There were no rattles, the bus rode well and cornered smoothly and internal features like lights, emergency hatches and bell pushes were all designed as part of the bus and not just added on. The seats I found were comfortable for the whole trip and both doors were wide and enabled speedy disembarking of passengers. If we are going to be a nation of imported cars, and even imported trains now, why not at least some imported buses of this quality design?? Even Japan knows a winner when it sees one outside its borders. Yep, that's definitely correct, but it is irrelevant to drivers because the driver doesn't take responsibility to maintain the bus. Swift wrote: So now that we know that any regular length bus put on a 14.5m route is likely to fill up too quickly, is there any other reason on offer why drivers would hate it? 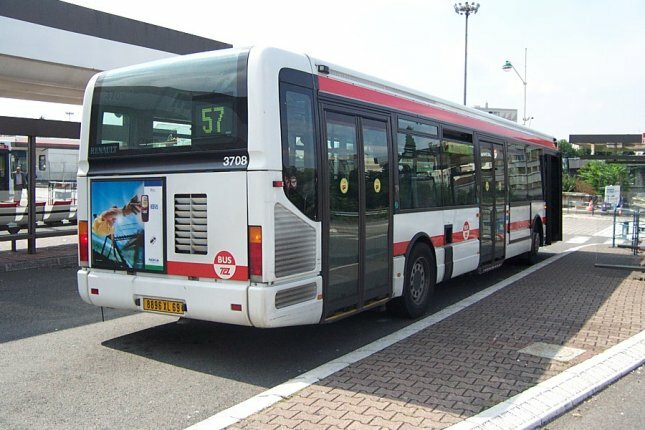 One more thing should be mentioned: the demonstrator Citaro was equipped with a Voith 4-speed gearbox which is not good at high-speed services as it makes the engine sounds noisy, such as any routes via the southern busway like 111, 150, 140, 130, etc. Most services via the busway are utilising ZF gearbox except some CNG buses (MAN CNG bendy), but it doesn't matter because the CNG engine is fine in high engine speed and even they need high engine speed for better torque.